If you wake up tomorrow and oil prices have spiked to $100 per barrel, here is what will have happened. The initial spike to $100 per barrel would just be the beginning. Between them, Iran and Saudi Arabia produce roughly 14 million barrels of oil per day. There is no way to compensate for any significant percentage of that production being wiped out. 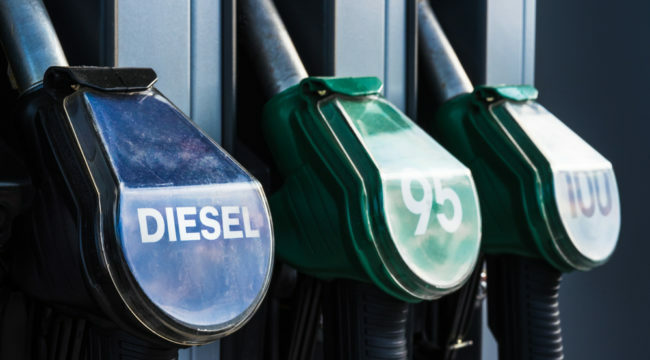 The spiking oil price will decimate the global economy. Even more concerning will be how the rest of the world gets pulled into this conflict. Israel is already on the brink of war with Iran and will be raring to go. It gets even bigger with Russia (supporting Iran) and the United States on the opposite side of the fence in this region. I’m disturbed by how quickly this scenario could get out of control. I am far more disturbed by how very realistic the sequence of events are that I’ve just laid out. The actual firing of the missile won’t be done by an Iranian. It will be done by a Houthi Rebel based in Yemen who will have been supplied the Burkhan – 2H by Iran. 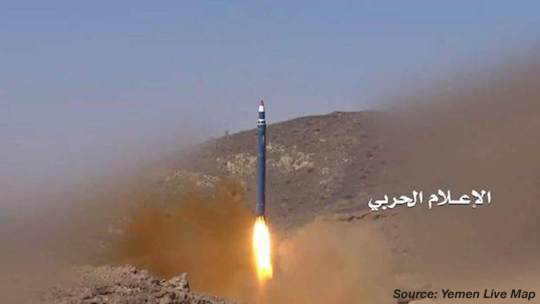 This is not my theory, we know that the Houthis have these missiles and we also know that they are willing to use them. Yemen is located directly south of Saudi Arabia. The Saudis are involved there because they want to stop the rising power of Iranian supported Houthis in the region, which already escalated into direct conflict once before in 2015. The Houthis have already fired Iranian supplied missiles at Riyadh and are now openly targeting key Saudi oil infrastructure (refineries, pipelines, tankers). 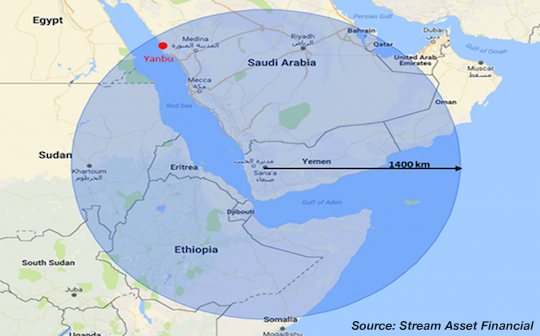 The graphic below shows the range of the missiles that the Houthis have and it clearly shows that all key Saudi oil infrastructure can be reached. The Houthis claim to have already hit some of that Saudi oil infrastructure (a refinery) in the summer of 2017. Whether they have or not is impossible to prove since the Saudi Kingdom is very tight lipped about such things. If the Houthis were to hit something really important, like for example the 5 million barrel per day east-west Saudi pipeline, it would obviously roil the oil market. After all, even the Saudis can’t hide that much supply being taken offline. The real big picture concern though is what the Saudi response would be. The young, aggressive Saudi Crown Prince Mohammed bin Salman has already threatened to move the “battle” to Iran, in response to previous missile attacks. And given his previous bold actions both domestically and abroad, I don’t think we should discount those words. It would almost be hard to blame him. With the Iranians shooting missiles through their Houthi proxy at his palace, one can understand why he would want to fire something directly into Iran. We are one successful Houthi missile away from an oil market disaster. The missile doesn’t need to hit Saudi oil infrastructure. It just needs to hit something that pushes the Crown Prince to retaliate.